This pair of earrings uses the wire leaves from these instructions as dangles. Once you have learned to make this basic leaf shape, it is easy to make variations including a leaf with a center vein that you can add beads to. 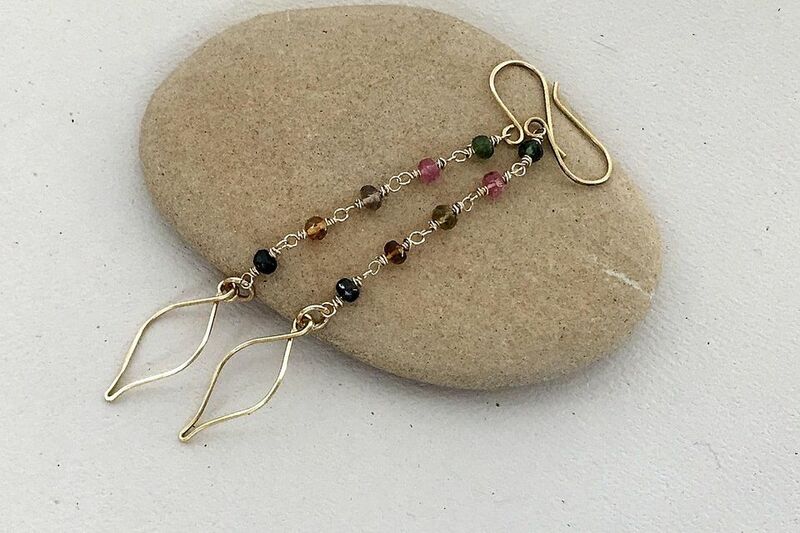 The tourmaline gemstone chain is made using a variation on the wire wrap loop technique to make a bead chain. We call the variation a double wire wrap loop and it results in a slightly thicker wrap around the main wire. It takes a little more wire but if you can make a wire wrap loop, you will find it easy to make a double wire wrap loop too. These simple wire leaves can be used in a lot of different ways in your jewelry designs. They can be used as frames to add beads to, as dangles on earrings, or a focal pendant. They are very easy to make too - with just a few basic wire working tools. This step by step will show you how to make the pointy end leaves on the right in the picture. To make wire leaves, you will need 20g or 22g wire. We are using 20g red brass wire - but this project will work equally well with copper, craft wire, sterling silver or gold filled wire. The size of the wire is also variable depending on how large you would like your finished leaves to be. The pictures in this project start with a piece of wire 3 inches long and make a leaf about 1 inch long. You will need basic wireworking tools including chain nose pliers, round nose pliers, flush cutters. In addition, you will need something round to wrap the wires around. We use plastic step mandrels meant for jewelry making. They are so affordable and useful, we highly recommend them, but you can also use the barrel of a pen or marker. If you have a ring mandrel or step pliers, those may work as well. It really depends on the size of the leaf you are making. Cut a piece of wire and mark the wire in the center. Fold the wire in half in the middle using your pliers. If you didn't get it right in the center, you can trim the wire ends to make them even. Use your chain nose pliers to press the wire together in the center. This is what will give the leaves a pointy end. If you don't press the wires together, you will make a more rounded wire leaf. Gently pull apart the wires so you have a deep V where they meet. Wrap the wires around a mandrel and push the wires around the mandrel until they meet. You will usually need to shape it one more time around the mandrel, so just beginning to get the rounded sides at this point is fine. The initial wire leaf shape will resemble a stick fish figure (you know what we're talking about right?). Turn it to the side and you'll see. Make a simple loop on each of the wire ends. This is the loop that you will either hang the leaf by or add a jump ring to this loop. Plan the size of your loop accordingly. Re-shape your leaf around a round mandrel and push the two simple loops so they are aligned. Your leaf is done. You can use a hammer to lightly hammer the sides and the pointy end of the leaf shape. Do not hammer the loops since they will probably get bent out of shape.